The 11th Annual SCoTENS Conference took place in Sligo on 10-11 October 2013. The theme of the conference was ‘Learning Teaching: Reimagining the Profession’. There has been much debate about the future of teacher education and, indeed, about what it means to be a teacher. At the heart of this debate is an expansion of the concept and context of teacher education. Competing conceptions of teaching as a craft, the teacher as an executive technician or as a critically reflective professional also inform such debates. In this context, teacher education is still seen as being rooted in the period of initial teacher education. But the idea of the continuum of teacher education is driven by the idea of the teacher as reflective practitioner throughout their lives – or lifelong learners. 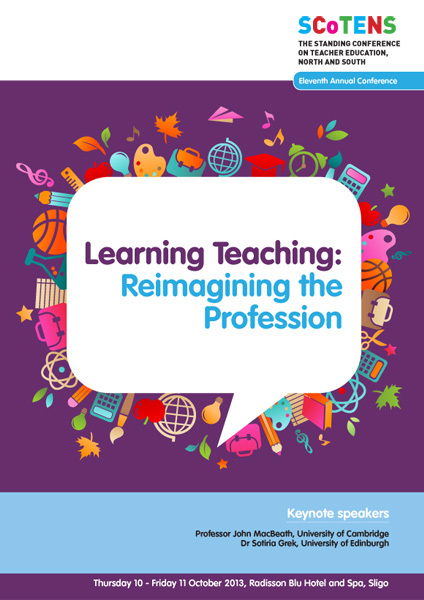 This reimagining of the profession flows from the idea that teachers are always learning, so that they can always teach. Our conference seeks to explore how this lifelong learning can unfold in a variety of contexts. Conference discussions will range from the nexus between practice and research to reflections on the implications for policy development. SCoTENS invites all those with an interest in teacher education to inform, enrich and inspire the discussion around these issues. Official opening by the Northern Ireland Minister for Education, Mr John O’Dowd MLA. Official opening by the Republic of Ireland Minister of State for Training and Skills, Mr Ciarán Cannon TD. Keynote address: Professor John MacBeath, University of Cambridge – Teachers, Teaching and Schooling: Quo vadis? This presentation/workshop will contrast the experience of two practising teachers who have recently conducted research in different educational contexts. The facilitators will draw on their research experience to examine how teachers can benefit from being both consumers and producers of educational research. This workshop will explore various aspects of the practice of teaching and how prospective teachers learn to teach. One presenter will describe a new module that bridges the college and school experiences of student teachers. This workshop will explore the nature and detail of 21st Century teaching and learning activities within a number of creative classrooms, North and South. The key to this fostering is the relationship that each leader has with their colleagues, and the kinds of relationship that colleagues have with each other. In order to share and communicate the developing and evolving methodologies such as Reading Recovery; Literacy Lift Off; Better Basics; Maths Recovery; Stop Ask Listen Tell (SALT) the quality of the relationships that the leaders have is very significant.